summer is a great time for music festivals and the V-Festival isn’t the only one around, but it is a great way to cap off a summer and make memories to last a lifetime. The festival is held at two parks at the same time, with the bands working the festival swapping on the two days the festival takes place. So the performers from the first location on Saturday play the second location on Sunday and vice versa. The festival is mostly for rock music but other genres are catered to as well making the V Festival a pretty popular festival in the United Kingdom. If you want to cap out the summer right, but are worried about the travel, then let ST Minibus Manchester take care of everything for you. The V Festival has been around since the mid-90s and has quite the history to it despite its relative young age when compared to some other festivals. The festival began when the lead singer of Pulp, Jarvis Cocker, said he wanted to play two gigs in two days in two locations. 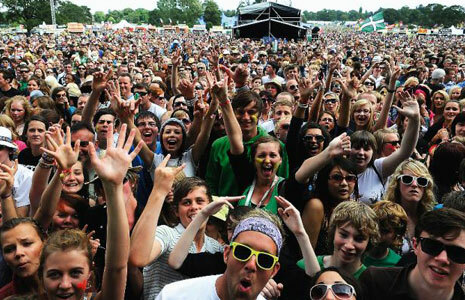 The idea for the gig grew and eventually it became a full-fledged festival held in both Staffordshire and Chelmsford, letting people in both the south and the north of the country enjoy the festival and the bands at the same time. Since then the festival has continued to grow and become popular. The festival is sponsored and hosted by the Virgin brand, hence the V in the name. Because it’s a two day festival a lot of the festival goers decide to camp on the grounds and enjoy both days. The idea of camping is a pretty good one until you consider all the things you have to take with you when you camp. You’ll also have to leave your car overnight which puts it at risk, and racks up a high parking ticket. You can most likely find a place to park on the grounds but it won’t be cheap. With that in mind a solution like hiring a minibus is a pretty good idea. You don’t need to worry about parking fees or having space for all your things. You should also go to a festival with friends, and putting their stuff (and them) in a car can become annoying quickly. Take all those worries and al that stress away by hiring a minibus from ST Minibus Hire Manchester. Our professional and friendly drivers will get you to the event with time to spare, and pick you up when everything is said and done and you’ve had one of the best weekends ever thanks to great music. Book a minibus either through our online form, or giving us a call directly.